Sebastien Bigo is a busy man, heading two Bell Labs research activities related to dynamic optical networks and managing a team of about 15 researchers. He is also the author or co-author of 36 patents, three reference books, 250 articles and regularly speaks at conferences and guest edits technical journals. Yet somehow he finds the time each year to spend 10 days at the Cannes International Film Festival, watch 40 movies, and blog about them for his 14,000 visitors. A native of the French Riviera, he first attended the film festival 20 years ago, and hasn’t missed one since. While attending the University of Besançon, Bigo studied optical processing for high-speed soliton transmission systems. His work in this area, which was the subject of his doctoral thesis, was well received in the industry, as was his world-first demonstration that high speed solitons could be fully regenerated and sent over transoceanic distances just by interacting with a light beam, free of any high-speed electronics. As research on Wavelength Division Multiplexing (WDM) gained in popularity, and interest in soliton-based research receded. Unphased, and recognizing the potential, Bigo switched his attention to WDM. What followed was an extensive record of achievements: 25 successive world records in the transmission laboratory by his team since 1996. For all of his time and success in the lab, Bigo’s most satisfying experience results when research transfers from the lab bench into development and into the market. And Bigo has had lots of satisfying moments. Among them are TeraLight™ Fiber, which has sold in the millions of kilometers; the 40 Gb/s coherent systems for submarine applications; and the 100 Gb/s coherent transponder which Bigo highlights as one of his team’s most significant successes. Today, Bigo’s team is channeling their research into the new challenges arising in the industry – those related to data centers and cloud-based services as well as the ever urgent need to lower operational costs. Given their track record of success, expect to see the results of these efforts quite soon in the market. 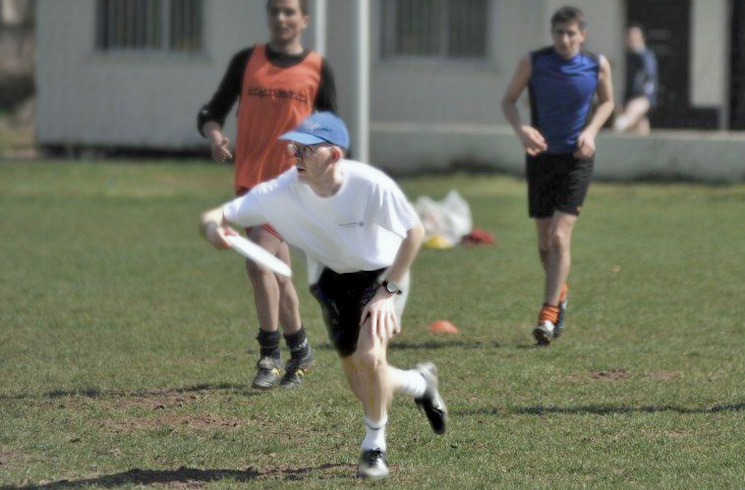 Sebastien Bigo and his team playing ultimate frisbee.